When we heard that our friends at Create Pro has done the impossible to get a Thunderbolt card running in a Mac Pro Cheese-grater, we knew we had to bring it to you. The last time my 2009 Mac Pro saw the light of day was back in the summer of 2018 when I needed a 4th machine for an event I was running. I remember thinking back then how snappy and quick it was for an older machine. Back in 2015, over a period of about 9 months the team at Create Pro had taken this machine from a Quad core up to a 12 core machine running with the fastest available processors and 32GB of RAM and a new graphics card. But at that time, that was as far as we could go. No more processor upgrades and sadly no chance of getting Thunderbolt onto this machine, or so I thought. It was quite by chance that I was chatting with Charles from Create Pro who just happened to mention that he had managed to get a PCI-e Thunderbolt card running on Mac Pro cheese-graters. What we always thought was impossible was possible. To say that my interest was instantly sparked could be understatement of 2019. As you may know, the old Mac Pro towers, which have been dubbed the ‘cheese-grater’, have not been able to support Thunderbolt cards, even though they exist and can be used in Windows computers. This is because there are no Thunderbolt Drivers available for the Mac OS for these older machines. Even if you go looking to install the Thunderbolt drivers and Thunderbolt Chipset drivers there are none available for the Apple operating system that can be used on these machines. So how did they do it? Because there are Windows drivers available for Thunderbolt cards, the first thing you need to do is to install a copy of Windows 10 onto your system. To do this you will need to set up Bootcamp on your Mac and either add a Windows partition to an existing drive or add an extra drive to your system so it can boot up into Windows 10. Once in Windows you install the Windows driver for the Thunderbolt card and the Thunderbolt Chipset. You will also need to install any Windows drivers for the Thunderbolt devices you want to hang off your machine. In this case we installed the latest UAD-2 software to run my UA Apollo Twin, Arrow and Apollo X16 interfaces. Once the drivers for the interfaces are installed and Windows is seeing the new Thunderbolt interface you can do a “warm boot” into Mac OS. By this I mean do a restart and hold down the ALT key to give you the boot drive options. Then start Mac OS normally. By not fully shutting down the machine the Thunderbolt card is kept “active” and hence it still works when you boot into Mac OS. Now some may call this is ‘hack’ but in my world it’s a ‘work-around’ and it means that any of us who have been wishing to use our old but still very powerful machines with brand new shiny Thunderbolt interfaces can now do so. What it will mean is that each time you power up your computer you will need to boot up into Windows and then restart and boot into the Mac OS using the Alt. The moment you turn off your computer, you lose the Thunderbolt drivers and you will need to boot up into Windows, which will load the Thunderbolt drivers and do the warm restart into the Mac OS. For me this is less of an issue as I leave my computer running 24/7 so the Thunderbolt drivers will stay loaded. It does of course go without saying that this is not a supported method of running Thunderbolt but at the same time it works. In this video we present an exclusive demonstration of my old Mac Pro 2009 with a PCI-e Thunderbolt card running Pro Tools with a UAD Apollo Twin interface, showing it is possible to breathe yet more life into the Mac Pro 5,1 platform. Gigabyte GC-Titan Ridge Thunderbolt Card with drivers. The power cable you can see in the pictures is optional. It allows Power Over Thunderbolt for I/O like the UA Arrow. This cable would have to be custom made (which can be done) but it is not required if you don’t need Power Over Thunderbolt. 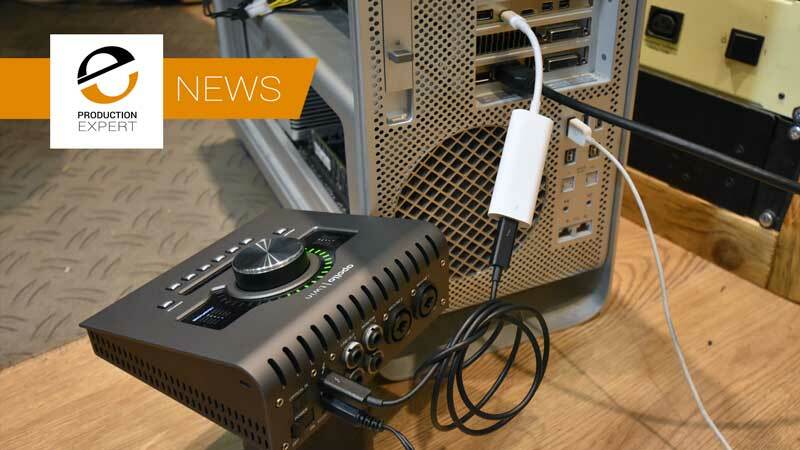 Although it is possible to do this yourself, if you want to be sure to get the right parts then our friends at Create Pro can supply you with everything you need to bring your Mac Pro 4,1 or 5,1 up to 2019 specs including Thunderbolt connectivity. The Latest On What The New Apple Mac Pro 2018 Might Look Like And What Could Be Inside? Replacing A Mac Pro 5.1 'Cheese-grater' For Pro Tools Production - What Are The Options? The Apple Modular 2018 Mac Pro - What Do I Think It Will Look Like? What Can You Upgrade On A Mac Pro 6,1 Late 2013 Trashcan?